Yeasayer are set to unveil their new album, ‘Fragrant World’, in full this week as part of a global scavenger hunt. “We have received message that we are on the verge of embargoed information being leaked through the cracks of the digital universe. Once again an attempt to tell the story before our mouths can spit. In order to have the edge we have created PSCYVOTV standing for PREEMPTIVE SELF-COMMISSIONED YEASAYER VORSTELLUNG or TRACK VISUALIZER. ‘Fragrant World’ is released on August 21 on Secretly Canadian. Self produced by Yeasayer (and mixed by Dan Carey), the new album is a wholly immersive record that takes a study to thoroughly to understand and enjoy – but your reward comes with time. It is an album that grapples with the schizophrenia of the modern world by gathering piles of electronics and moulding them into something vast and rather gorgeous. With ‘Fragrant World’, Yeasayer have once again constructed something fascinating that expands with each play. Ane Brun is pleased to announce that she and her band will open Peter Gabriel’s upcoming North American tour. The 16-date tour dubbed “Back to Front” will celebrate the 25th anniversary of his classic So which he will perform from start to finish — plus “some of his other biggest hits”. Ane has been collaborating with director Magnus Renfors on a film “One” based on music from her recently released album It All Starts with One. Watch the new video for “Words”, which is also the prologue to the film, on YouTube and Vimeo. Please post and share. Much like her music, the path that led Ane Brun to It All Starts With One was peaceful, unhurried and full of unexpected, subtle surprises. It’s taken her from her small Norwegian hometown of Molde, to Barcelona where she was a street performer, and across the US last year, supporting Peter Gabriel and singing on his New Blood album. The adventures culminated with the making of her new album It All Starts With One, a platinum hit in Norway for which she just won their Grammy equivalent, the Spellemann award, for best female artist. The lead single, “Do You Remember” features First Aid Kit, and the album also includes “Worship,” a powerful duet with Jose Gonzalez. Ane Brun has created an album full of struggles and the strength it takes to move forward. 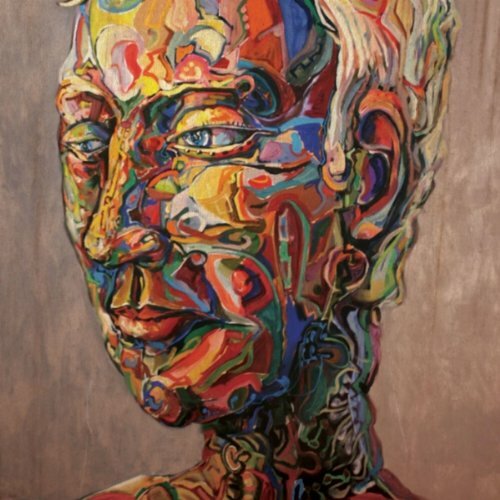 It All Starts With One is a revelatory work by an uncompromising artist at the height of her powers. Sept. 16: Colisee Pepsi, Quebec City, QC? Sept. 18: Bell Centre, Montreal, QC? Sept. 19: Air Canada Centre, ON? Sept. 21: Wells Fargo Center, Philadelphia, PA? Sept. 23: Nikon at Jones Beach, Wantaugh, NY? Sept. 24: TD Garden, Boston, MA? Sept. 26: Palace of Auburn Hills, Detroit, MI? Sept. 27: United Center, Chicago, IL? Sept. 30: Red Rocks, Denver, CO? Oct. 2: HP Pavilion, San Jose, CA? Oct. 5: Planet Hollywood Showroom, Las Vegas, NV? Oct. 6: Hollywood Bowl, Los Angeles, CA? Oct. 8: Valley View Casino, San Diego, CA? Oct. 9: Santa Barbara Bowl, Santa Barbara, CA? Oct. 13: Mohegan Sun, Uncasville, NY? 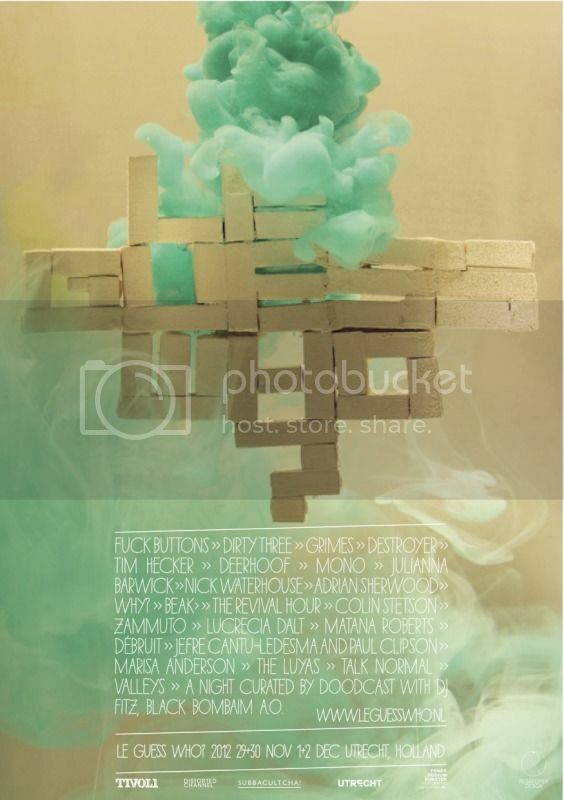 DEERHOOF, MONO,JULIANNA BARWICK, COLIN STETSON & MANY MORE CONFIRMED! Le Guess Who? has announced the initial lineup for their 6th annual music festival taking place November 29th – December 2nd in Utrecht, a city 30 minutes outside of Amsterdam, Netherlands. Le Guess Who? is one of the leading International festivals for independent music, with this year’s lineup including Destroyer, MONO, Julianna Barwick, F*** Buttons, Grimes, a special festival opening set by Colin Stetson, and many more. From today (AUG 1) you can buy tickets for all 4 days for $80 here. 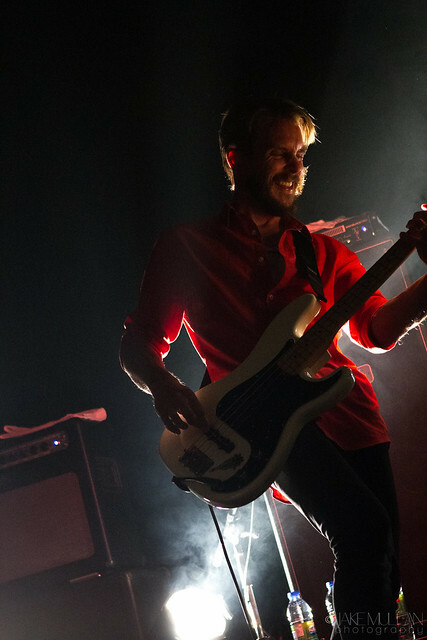 Last November the festival celebrated its 5-year anniversary with performances by Panda Bear, Bill Callahan, Low, John Maus, Suuns, and introduced the free mini-festival ‘Le Mini Who?’ proved to be a successful supplement. Moreover, Le Guess Who? commenced a spring edition called ‘Le Guess Who? May Day’, a one-day festival with shows of Cloud Nothings, Willis Earl Beal, Julia Holter and more. *A Night Curated By Doodcast With Dj Fitz, Black Bombaim A.O. ‘Getaway Tonight’ is directed by Joel Kefali from Special Problems (Tame Impala, Flying Lotus) and is inspired by b grade sci-fi and features frontman Kody Nielson as two cyborgs in orange. The track is taken from their forthcoming debut long-player ‘Electric Hawaii’ due out on Fire Records on Aug 7, 2012. New Zealand’s Opossom are also pleased to announce a US and European tour this coming October/November. Opossom’s blend of dense psychedelic fuzz in a shimmering set of tunes has set critics buzzing about their Electric Hawaii trip. Already selected as a Rough Trade Shop Album of the Week, Electric Hawaii has garnered praise from Uncut, Q and Mojo as well as coverage in NME (New Band of the Day), The Sunday Times and The Independent. Debut single ‘Blue Meanies’ went straight in to the BBC 6 Music playlist and has had been an evening play staple on Radio One in recent weeks. Opossom is a project from Kody Nielson, former frontman of Flying Nun’s “trouble gum art punks” The Mint Chicks. The album sees him taking a new turn on beatnik pop that mirrors his bandmate brother Ruban’s highly praised Unknown Mortal Orchestra. Kody brings the songs of Electric Hawaii to the stage with Bic Runga and fellow former Mint Chick Michael Logie. After three sneak shows in London earlier in the year showcased Opossom as an intense and thrillingly enjoyable trio, expectation is high for their upcoming performances. 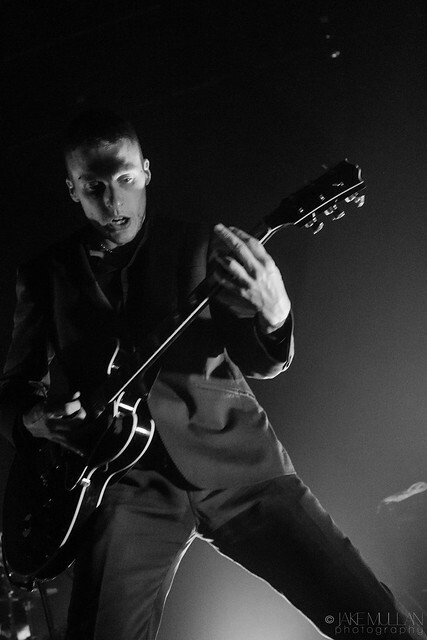 Let me first start off this review by saying this: Refused was before my time. I was a very young soul when they first broke out onto the scene. When I came out of my cave of musical ineptness, I knew they were great, and I knew there was a call for them to reunite, play some shows, or maybe make some new music. While the latter seems to be unlikely, I will say that I’m glad they chose to exit the underworld of disbanded groups – at least for the time being. 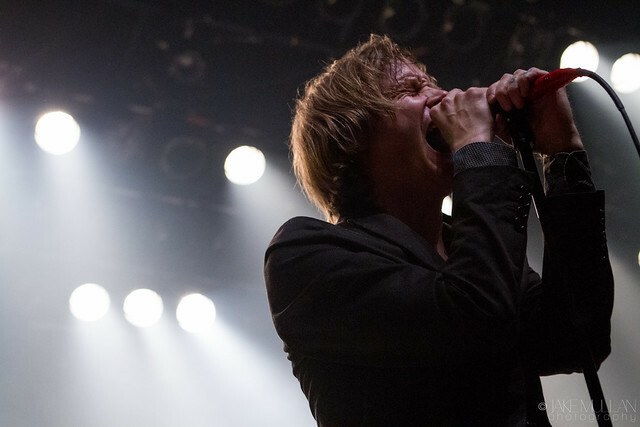 “Sorry for taking twenty years to get to Canada,” frontman Dennis Lyxzén said to the Montreal crowd, “I think we were supposed to come up here in 1998 – but then we broke up.” However, they sure as hell made up for it fourteen years later at their inaugural show in Canada. Fifteen songs that punched, rocked, and had the crowd of sweaty moshers moving from the back to the front of the Metropolis floor. Lyxzén: “I used to a very angry young man. So I was wondering if I’d be able to sing these same lyrics with the same meaning after fourteen years. And you know what? These words mean more than ever.” And after adding that the world is more fucked up than ever, he went right into it all. The band was tight, Lyxzén showed ferocity and energy that is seen in very few performers these days. 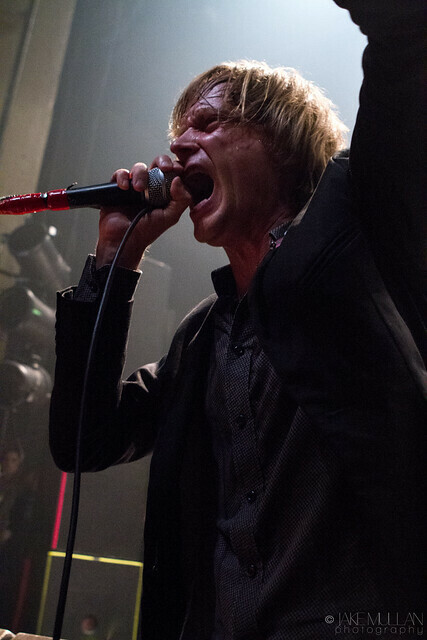 “Coup d’État” rang through the venue with blistering noise and precision, “Rather Be Dead” was forceful, and “The Shape of Punk to Come” could’ve very well ended the night with the whole crowd satisfied. But then they had to do an encore. And the opening notes of “New Noise” were heard. And then Lyxzén launched into the vocals. I haven’t been attending concerts for very long when you put my lifetime into a grander perspective, but I can honestly say – and others who have been seeing shows for much longer than me can attest to this – that I have never felt chills like this at a show. Never. This was an amazing spectacle, from a bunch of Swedes who wanted to play some punk music. 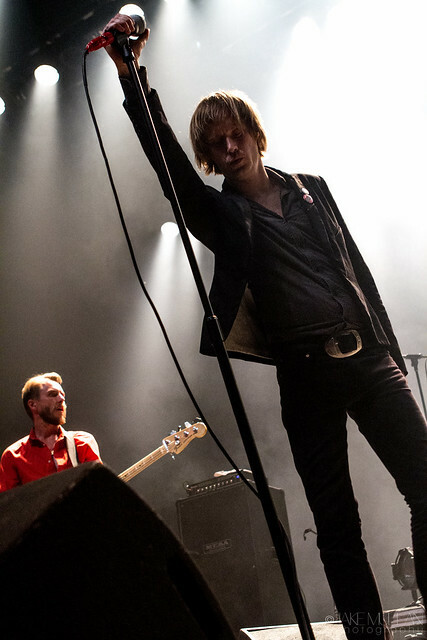 To those of you who never got the chance to see Refused live – I pity you tremendously whether you enjoy the genre or not. Twin Shadow’s album Confess is one of the best new records I’ve heard in months. Confess features eleven (including the hidden track) eminently danceable tunes steeped in the aesthetic of 80’s synth pop. 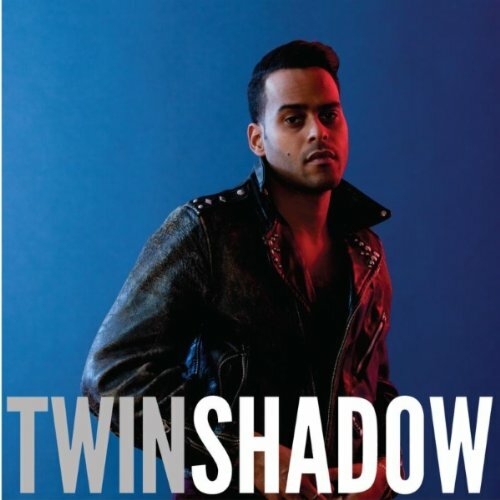 Twin Shadow is the name under which the photogenic George Lewis Jr. has performed since 2006; on Confess he reveals himself to be a songwriter and producer of remarkable talent. If his voice reminds me of anyone in particular, it’s Babatunde Adebimpe of TV On The Radio, but there are echoes of the venerable Peter Gabriel and Sting here as well. The debut track “Golden Light” begins with a lovely little synth line that quickly gives way to the chorus: “Some people say there’s a golden light you’re the golden light/ And if I chase after you it doesn’t mean that it’s true.” “Golden Light” is a good touchstone for the album in that it is sophisticated and complex without ever sounding pretentious. Although Lewis’ production employs analog-sounding synths and drum machines, there are bursts of guitar here and there (as on “Patient”) that complement things very well, much like in St. Vincent’s recent work. You can hear the influence of the Cure on songs like “The One” but I also hear traces of 80’s soft rock radio here- Richard Marx, anyone? Although Confess is very much a dance record, the songwriting is so strong that these songs could be performed on an acoustic guitar by a campfire and remain intact. The hooks are big enough to catch whales. If you, like me, are a fan of New Wave as well as of Ariel Pink and Neon Indian, you’ll find a lot here for your listening pleasure. Mr. Lewis’ approach is more electronic than that of Mr. Pink, and more melancholy than the relatively upbeat Neon Indian, but he shares a certain aesthetic with them in that he steals from his influences generously and then melts them together in exactly the correct proportions so that the resulting musical alloys are stronger than their inputs. I’m planning on revisiting Mr. Lewis’ debut record but in the meantime I’m already looking forward to his next one. Don’t be fooled by Mr. Lewis’ detractors: to reach the future one always begins by pillaging the past. If you hate the childish lyrics please remember: lyrics are for suckers. Usually. Be bop a lula, tutti frutti. What constitutes your version of happiness? Does it involve a particular place or event? Is it centered around a certain person or group(s) of people? Is it tradition-based or more of a spontaneous nature? In their latest album Idea Of Happiness, electropop band Van She takes listeners along for a ride as they reveal their own rather convincing ideas of happiness. Hailing from Sydney, Australia, Van She formed in 2002 after the members met through friends. The band consists of quartet Nicholas Routledge on vocals/guitar, Matt Van Schie on bass guitars/vocals, Tomek Archer on drums/sequencer and Michael di Francesco on synth/guitar. The band went on to release their first self-titled EP in 2005. Van She’s popularity grew as they toured with the likes of Yeah Yeah Yeahs, Daft Punk and Phoenix, leading to the 2008 release of their first studio album titled V. A remixed EP version of V was then released in 2009 titled Ze Vemixes. The electropop/nu-gaze sound make for danceable 80’s inspired tunes with a modern twist. 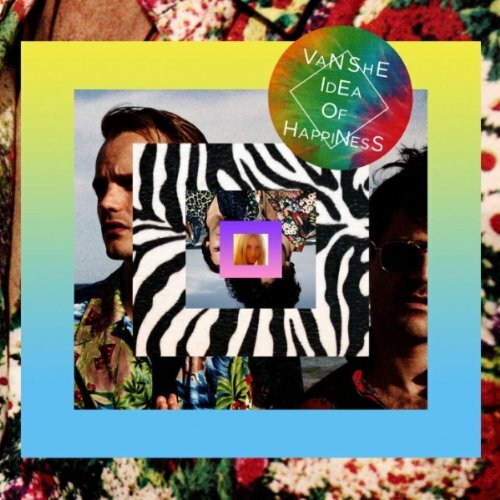 Idea of Happiness—Van She’s second studio album—was released on July 10th 2012 by Modular Recordings. The fun and catchy title track is the album’s first single and was released on May 4th 2012. The single—if not the album as a whole—is well timed in that it perfectly embodies summer in all its glory. The album’s shoegaze, disco and 80s elements combined with themes of escape, vacation, dancing and love make for a dance-based beach party experience. Tracks like “Jamaica” and “Coconuts” instantly trigger images of blue skies and sandy beaches while “Calypso” and “You’re My Rescue” could easily have made their home in 80s teen movie soundtracks. However, even the darker side of paradise can be explored through tracks like “Sarah” and “We Move On,” both of which reflect a moodier tone with their Depeche Mode-like vibes. “We Move On” might be the album’s most standout track in that it has an 80’s feel with an unexpected hint of dubstep. With a style reminiscent of Chromeo and Miami Horror to name a few, it might be hard to resist these upbeat tunes. Regardless of one’s idea of happiness, Van She’s exploration on the matter is likely to seduce a variety of listeners pining for carefree, relaxed fun. “We’ve got so much time to think about yesterday,” says a lyric in the single “Idea of Happiness.” Perhaps this album may prove to be the soundtrack for some to eventually look back and do just that. There’s more than one reason that Milo Greene listeners may initially believe that the five-piece band is actually just one musician. First of all, the group’s name itself, taken from the fictional manager band members Andrew Heringer, Robbie Arnett and Marlana Sheetz invented in their amateur days to boost publicity, implies one solo musician, hopefully named Milo. The misleading misnomer finds substantiation in the group’s effortless harmonies and consistently fluid melodies; its almost easier to believe that the masterfully polished self-titled album is the work of a single musician than that of five. The album has an easiness to it that belies its number of makers. In any group, especially as the number of members rises, there are compromises, concessions that can drag down the overall quality of the final product. Fortunately, Milo Greene appears to be made up of five soul mates because their album contains none of these things. Even on the well meaning but grossly out of place “Moddison” and “Orpehus” interludes, Milo Greene goes all out, carefully choosing from their admittedly large arsenal of skills the perfectly nostalgic melody and harmonies that may allow you to question their motives for putting this song here, but never their talent. When you learn that four out of five Milo Greene members were previously lead singers, their rich, flawless harmonies make sense. They all play their instruments skillfully and with purpose, from the tambourine on “Son My Son” that takes the song from a fairly generic folky pop track to a song you want to sing with your friends around a campfire to the muted but strong bass line of “What’s The Matter” that adds just a touch of ominousness. But, to be honest, its their complexly-arranged yet delicate-sounding four-part harmonies and the myriad of combos therein that elevate Milo Greene beyond other California surf-folk groups. On “Perfectly Aligned,” their vocals are…well…perfectly aligned, feeding into each other and enriching each other in a dreamy, minimalist round. And like any good pop group, Milo Greene’s catchy, cheerful tracks get stuck in your head for days, leaving you nodding your head and asking “What’s The Matter” to everyone in your path. Hot summer nights, and even hotter summer days, almost demand to be experienced in the company of Milo Greene’s self-titled debut album. Dreamy yet bright, every single track is a winner, the five members of the band displaying the skillset and musicality of a thousand Milo Greenes.